At age four, Sarah Grimké, daughter of a Charleston, South Carolina aristocrat, inadvertently witnesses the brutal flogging of one of the family slaves. The trauma of that experience never leaves her. At age eleven she is gifted a slave of her own, Hetty 'Handful,' to be her handmaiden. Where the story goes from there really should not be any surprise, and it isn't. But the telling is nonetheless a tour de force. 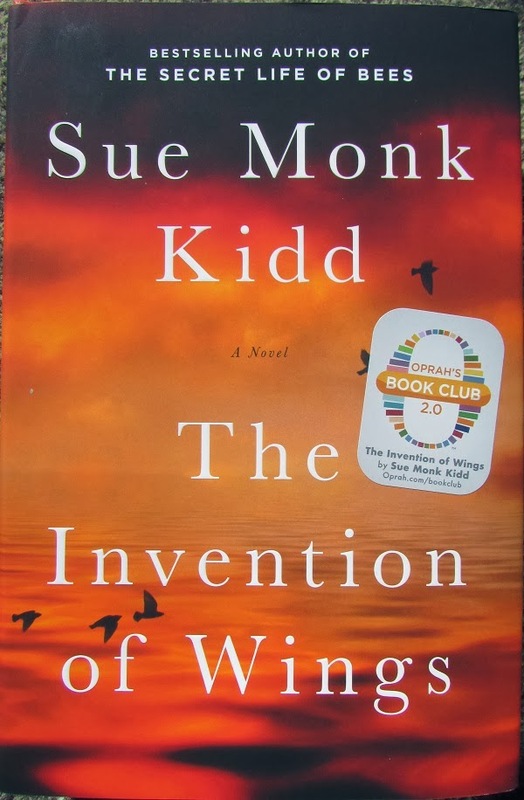 The Invention of Wings is written in the first person with chapters alternating between the points of view of Handful and Sarah. Handful is a slight, plucky third generation slave descended from the Fon people from the kingdom of Dahomey (now eastern Benin and a bit of far southwestern Nigeria). The Kings of Dahomey derived most of their income by selling slaves to European interests, contributing as much as 20% of the Atlantic slave trade. Handful is a fictional adaptation of a real slave who was given to the real Sarah Grimké but appears to have died in her teens. In the book, Hetty lives a long life filled with all the horrors and injustices of a slave's existence. Kidd portrays her with sensitivity and realism. We share her travail and her unending yearning for a better life - for freedom. Sarah is a rather plain middle child in a huge family (eighth of fourteen children). As Handful expressly states in the book, Sarah is as psychologically fettered by her station in life as Handful is physically fettered. Sarah struggles with denial of her ambition to make a real impact on human affairs. As a child she hoped to be the first woman lawyer. As life tramples her down, she lowers her expectations, simply aspires to avoid becoming a spinster, and even fails at that. The novel remains true to most of the historical facts of her life. It is interesting that Kidd chose not to bring Sarah's younger sister Angelina into the fold of the first-person narrative. In her after-note Kidd explains that she felt a stronger identification with Sarah, even though Angelina was the more vocal and outspoken of the two. More importantly, I think, Sarah's life more easily translates into compelling fiction. She was more reserved, often deeply conflicted - a much more complex personality. And (from the writer's standpoint) her fictional relationship with Handful falls into place more readily. In addition to the sledge-hammer issue of human slavery, Kidd explores more subtle issues that still trouble humanity today: female oppression and racial parity. It is a telling commentary on early 19th century liberalism that the Quakers expelled Sarah for her radical views--as much because she was a woman as because she was a woman advocating immediate and complete abolition. The book was hard to put down. The writing style is brilliant without being ostentatious. The character development and dialogue are sterling. The plot works, though there are a few scenes where a little more imagination could have improved the realism. The story of both characters is one of helplessness in a merciless white male dominated world. Yet in the end it's a story of triumph. The ending is satisfying - perhaps moreso than that of their real world counterparts. The book ends in 1838, which happens to be the end of the real-world Grimké sisters' public speaking tour. Both of them abruptly 'shut up'. Though they remained active behind the scenes through the rest of their long lives, never again did they take center stage. Courage and conviction can only take you so far. I suspect that the sisters were simply unable to sustain their energy level in the face of the overwhelming and vocal opposition. They were just too far ahead of their time.